In a desperate attempt to reclaim his lost kingdom, Aoife's father offers her in marriage to Strongbow, son of the Anglo-Norman conqueror Lord Pembroke. This dramatic portrait of a fierce warrior who sought glory in a hostile foreign land and his wild Irish princess is an epic saga of love, war, and survival in 12th-century Ireland. I first read about Richard and Aoife in Denee Cody's The Conquered Heart. I loved it! A historical romance that had real characters and a real historic setting? Just what I love the most. I set about researching everything I could about them to see if what I had read was real or not. I didn't find much and what I found was mostly courtesy of Wikipedia. A few years later I found the books of Elizabeth Chadwick. I love her books, have been reading them as they are published and she is one of my favourite authors. You can see how thrilled I was when I saw Richard and Aoife's daughter as one of the main characters in a couple of her books. 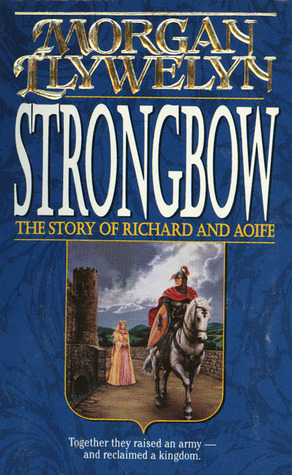 I loved those books but I still wanted more about Strongbow. I was quite happy when I discovered this book existed and quickly managed to get my hands on it. The book is written, both from Richard and Aoife's point of view, in alternate chapters. It depicts first Richard's childhood and young adult years. His relationship with his father, and how that will influence him for the rest of his life, his relationship with his father. Then Aoife's relationship with her own father, a man with a fearless reputation but apparently very close to his children. When Dermot MacMurrough, Aoife's father needs help to regain power and lands in his native Ireland he goes to England in search of a champion. To convince Richard he promises him what he cherishes the most, Aoife and his own kingdom after his death. Aoife isn't as happy as her father with the bargain but she eventually agrees to the marriage. She and Richard will fight and conquer both the lands and power that her family and his will wanted. I wonder if this is a good example of Llywelyn’s work? I’ve heard of her before but mostly in connection with Lion of Ireland, her book about Brian Boru. I will continue to look out for books about Richard and Aoife. A couple of years ago I reread The Conquered Heart and, after all the meatier medieval reading I had been doing it seemed lighter and more romancified than what I remembered. I guess my hope is that Elizabeth Chadwick will eventually think of them as main characters for one of her books. That would make me really happy! That would be nice if Chadwick wrote about them, wouldn't it? I've read Wind From Hastings and thought it quite good, although a bit too short for my tastes. There's another fluffy romance about these two (the name escapes me fortunately), but you do not want to read it. Most TSTL heroine ever. It would, oh it would be so good!! But we asked her once and she said she wasn't thinking about it. Of course she can always change her mind right? I haven't read Wind From Hastings but I will proceed to put it on my wish list. You're right, no more fluffy romance about these too. Thanks for the recommendation. Another great review! Going to have pick this one up as well.